I'm fairly certain that it was made of wood and was quite high, but things often seemed higher than they actually were when you were young. Our school cross-country run used to take us along the canal, then what is now the Shingle Bank and then along the cliffs to the old searchlight at the top and then return the same way. I'm sure I can recall at least once doing part of the assault course by crawling through some pipes but I might of got that mixed up with wondering about out there outside of school. Thamks Minsterboy for the information. 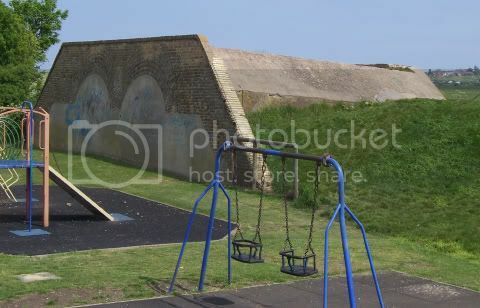 The wall that you refer to wasn't in the middle of the canal, it was on the side of the canal, directly opposite Seager Road and was part of a practise assault course that was laid out on the Bartons Point firing range. They used to have to scale the back of the wall and jump into the canal and it was still there when I was at the Secondary school in the late 1950's. I'm sure that I remember the school at some also using part of the assault course in their cross-country runs. You can still see the stumps of the wall's uprights against the bank. Hi, I believe the building of the railway halted the works at the western end of the canal. Magazine near allotment's rear of Nursery Close Sheerness. The first one is the one in the pictures. The second i think is something else and the third i have no idea. I thought you were talking about a bigger one, this was very small but where the football pitch is behind Queens Way it seems there was a larger one like the one further up the canal towards Barton's Point. Along the canal/Lines near Edenbridge is the remains of a brick structure, which i believe was an expense magazine. It is small with a vaulted roof and extremely thick walls. 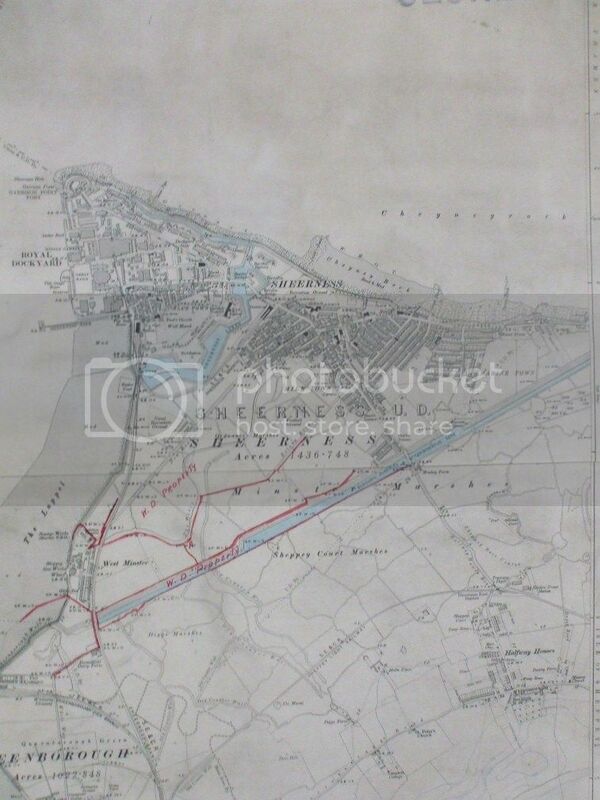 Each of the above mentioned sold a chunk of land to be developed into the Queenborough Lines, James Lake owned land near Westminster and this plan shows the proposal of a fort there. The people listed below have all given up/sold a piece of their land for a good cause on the island in 1860. Who were they? Why did they own large chunks of land? What did they do to deserve roads names after some of them? Charles Polson - 1874 Apr 11th Lord Of The Manor Of Minster chas Polson. 1875, APR 11 CHARLES POLSON LORD OF THE MANOR AT MINSTER. POLSON Charles, chemist & druggist & agent to the National Mercantile fire & life insurance, High St, Mile Town. Exors of Alston - c1617-1892: Kent (Minster in Sheppey). Alston close? Baroness Wenman - Baroness Wenman was a title in the Peerage of the United Kingdom. It was created on 3 June 1834 for Sophia Wykeham. The barony became extinct on her death on 9 August 1870. Dumergue and others - Dumergue Ave, Queenborough.